Laptop Rental UAE - LED TV, Screen Rental Dubai - Hire Laptops How to Manage Apple TV Apps on LED TV? As an Apple TV user, if you have managed to download the multiple apps it enables you to download, but struggling to organize the apps on the home screen, you are just at the right place. 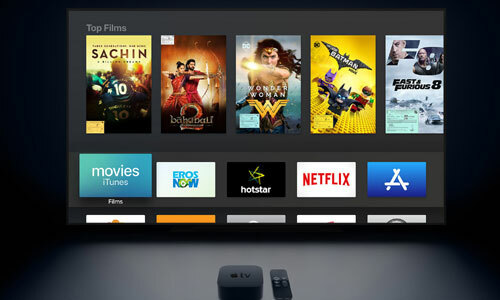 However, before we take a deep dive into how to organize the Home Screen, we would like to give you a brief introduction of what an Apple TV is. An Apple TV is basically a set-top box which Apple has launched as a “hobby”. You can connect the Apple TV to an LED TV, which is ideally not a smart TV, through HDMI and access the multitude of apps available on the App Store. The Apple TV comes equipped with a remote which helps you navigate through the Home Screen displayed on your TV. At Techno Edge Systems, we offer LED TV rental in Dubai to make your experience worthwhile. How to manage the apps on your TV? Once you download all your favorite apps from the App Store, you might find yourself in the middle of a situation called the Home Screen Confusion, where you’re Home Screen in filled with so many apps, that you have to scroll up and down to find the app you need. However, if you have learned how to organize your Home Screen using the remote, it can clear up the screen. How to move the apps around? Once you have downloaded the app you need, the app must have occupied a place at the bottom of the screen. And, almost all the apps that matter the most to you are scattered all over the place. Therefore, you need to organize the apps in an easily accessible manner. • First, you need to select the app you want to move using the Apple remote or an alternative remote. • If your remote is a touchscreen remote or an ordinary remote with physical buttons, you need to press down your finger on the select button until the app begins to jiggle. • Now that the app is jiggling in its place, you can move the app to the location of your choice by using left, right, up, and down keys. • Once you have moved the app to the new location, you can press the select button to release the app. • Repeat the steps to move multiple apps to the desired location. How to delete the apps that are not in use? Just like moving the apps, deleting the apps is also extremely important to free up space on the Home screen. Unused apps can be deleted in two ways. • Through Settings: Go to Settings->General->Manage Storage. The list of apps downloaded is displayed. You can select the trash icon on the right side of the app, which will enable you to delete the app. • From Home Screen: Select the app you want to delete and press down the select button until the app starts jiggling. Press the play/pause button on the remote. Then, choose the delete option from the list of options displayed. How to manage apps using Folders? • To create a folder, all you need to do is drop an app above another similar app following the steps of moving an app; a folder will be created. • You will be prompted to name the app; subsequently, the two apps will be tucked inside the folder. • To add more apps to the folder, you can move the apps and drop them on the folder. To pull the app out of the folder you need to follow the steps of moving the app and drag it out. Enjoy the Apple TV and the channels it offers connecting it to the LED TV. For LED TV rentals in Dubai, contact us at +971-54-4653108 or visit our website www.laptoprentaluae.com.